Posted on Thu, Apr 28, 2011 : 5:59 a.m.
Saturday, May 7 will be the 137th running of the Kentucky Derby. It is a glory day for the Thoroughbred horse. The breed has a fascinating history, and a vibrant role in the world of horses. There are many aspects of the horse racing industry that are worthy of exploration, but today's discussion will be limited to a brief history of the breed. All Thoroughbred horses are descended from three stallions imported from the Middle East to England in the 1600-1700s. Each has its own story and legend. In 1688, a nice young stallion was appropriated from a captured Turkish officer by Capt. Robert Byerly, under English King William III of Orange, at the Seige of Buda in Hungary. The horse was estimated to be 8 years old at the time, giving him a birth year of about 1679. The charger became Captain Byerly’s war horse and found his way to England. In between his many battles, The Byerly Turk proved to be a winning racer. He was eventually retired to stud in Yorkshire, England, where his offspring also proved to be strong, fast horses with exceptional stamina. 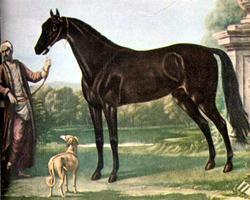 The Darley Barb or Darley Arabian was foaled in Syria around 1700. He was owned by Sheik Mizra II of the Fedan Bedouins. 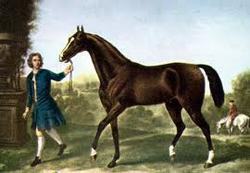 The young colt caught the eye of the British Consul, Thomas Darley, who purchased him from the Sheik for a steep price. The horse was not delivered, as the Sheik had second thoughts about parting with his prize colt. The Consul arranged for an alternative delivery strategy, and the horse was smuggled out of the country through Smyrna, Turkey, arriving in England in 1704. After a tumultuous start, the horse settled down to a quiet life on the Darley estate, where he was kept at stud until his death in 1730. His offspring were racing stars. Perhaps the most lore surrounds the Gololphin Arabian, foaled in 1724 in Yemen. Legend has it that he was one of four Arabian horses presented by the Bey of Tunis to the King of France. Typical of that breed, he was a small horse, at 14.3 hands high. Small horses were not in fashion in Europe at the time, and so perhaps these gift horses were not as valuable to the King as they were to the Bey. Three of the stallions were turned out into the Brittany forest to improve local stock. Legend has it that the fourth was found pulling a water cart in the streets of Paris, where he was spotted and purchased by Englishman Edward Coke, and brought to England. Coke died an untimely death in 1733, and left his horses to Roger Williams, who sold the Arabian to Frances, 2nd Earl of Godolphin. When the well-bred English mare, Roxana, spurned her intended English mate in favor of the little Arabian, an exceptionally fast race horse was produced, and then another. Roxana died birthing that foal, but the Godolphin Arabian went on to sire many champion race horses. These three fine-boned, quick Arabian stallions were bred to English mares who were slower, but also stronger and larger, and the athletic Thoroughbred was born. The General Stud Book was started by James Weatherby in 1791, and has been owned by the Wetherby’s ever since. All other breed stud books around the world are based on this record, the oldest and most comprehensive of all domestic animal pedigrees. The GSB and the American Stud Book are closed registries, meaning that only a Thoroughbred bred to a Thoroughbred makes a Thoroughbred. How many English mares were involved in “Project Thoroughbred?” Historical researchers have traced from 30 to up to 74 maternal inheritance lines. Modern genetic analysis of mitochondrial DNA, transmitted only from mother to daughter, suggests that the number of foundation mares may actually be as few as 12. Thoroughbred horses were imported to the United States, where they were influential in the development of many American breeds. 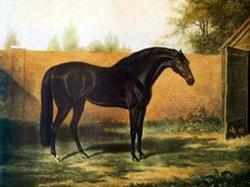 Notably, the Thouroughbred Janus (son of the Godolphin Arabian, whose name means "beginnings"), imported in 1756, stood at stud for 24 years, and sired many colonial race horses. He became the founding stallion of the American Quarter Horse. Through the years, about 35,000-40,000 Thoroughbred foals have been registered annually in North America. Worldwide, millions of Thoroughbred horses have been born over the past 250 odd years, mainly to race. All have descended from 3 foundation sires and perhaps as few as 12 foundation mares. They are all quite related. The Jockey Club in the U.S. maintains the American Stud Book. The Jockey Club website features a five-generation pedigree, which you can use to trace your horses’ famous relatives, all the way back to their English roots — more information than you are likely to find on your own human family. Kathy Lundberg is the owner of Scio Church Stables. Email her at scs@sciochurchstables.com.